- Browse our large selection of very unique, unusual, rare, and antique inventory. A to Z is family owned and operated - Not a corporate franchise. We offer a friendly, easy-going, and non-intimidating atmosphere for our customers. We understand your needs and strive to offer you the best customer service experience possible! The selection of items we accept and is more vast than anybody in the area. You really have to stop in and see what we're all about, or you may miss out! It's always fun to watch a customer step through our doors for the first time. We hear a lot of "WOW"s and see a lot of surprised faces. Why? - It's probably because most people wouldn't expect to find a knight's suit of armor, or a once-living baboon, or a horse statue made entirely out of brass at a pawn shop. We are much different than your common pawn or resale shop. 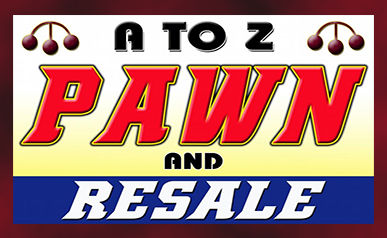 A To Z Pawn & Resale is a family-owned and operated business. We take great pride in providing excellent and friendly service to our customers. We like to stay unique and unusual, but have a wide variety of items we like to see come through our doors. (Click Here for the list of items we take in.) We understand that in today’s ultra-competitive economy we have to strive to earn your business and work even harder to keep it. We offer PAWN and CONSIGNMENT services, getting you cash when you need it most. If money is tight, we also offer great interest-free lay-away program so you can make sure you won't lose out on that item you just need to have. Lay-away is available on every item that we sell. There isn't another store like us in the area! Whether you are looking to treat yourself, or looking to find a present for that "special someone", our store is the place to find an item from a-to-z! We are confident that once you do business with us, you will be a customer for life.